A rather interesting month for oil. There is speculation that the Organization of Petroleum Exporting Countries and its partners will manage to ease a global supply glut. However America’s crude producers, which are increasing output, aren’t so sure. They’ve been hedging against price declines for this year and 2018. My guess is that oil will not go above $60, and the reason for the ceiling is the tremendous resilience of U.S. shale industry. It has been proven again and again. The ringgit is not performing up to par despite the latest data showing that the country’s international reserves are rising. Bank Negara’s international reserves, which are now at US$95bil, are set to be on the uptrend due to measures taken by the central bank since Nov 11 last year. The ringgit is now at RM4.44 against the US dollar. It has appreciated by about 1.3% against the US dollar, way below the amount that the other currencies in the region have appreciated against the US dollar. Foreign money is coming into the region and it is obvious that Indonesia is the best destination not Malaysia. Also Malaysia's creditworthiness worsened, deficit exploding to 4% of GDP business and investment "conflicts of interest" don’t pay. 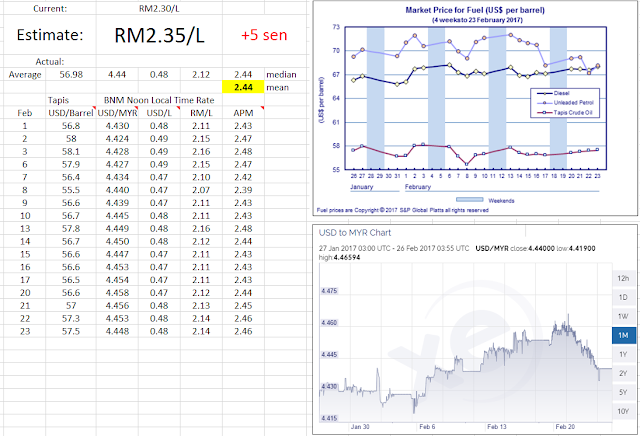 MYR maintained its weakness once again (@ 4.44), there are no signs of strengthening so far. However as consolidation global oil price on average went down by less than $1 (57.67 to 56.98) hence the RM/L between January and February weaken: 2.16 vs 2.12. Nevertheless it remains high. 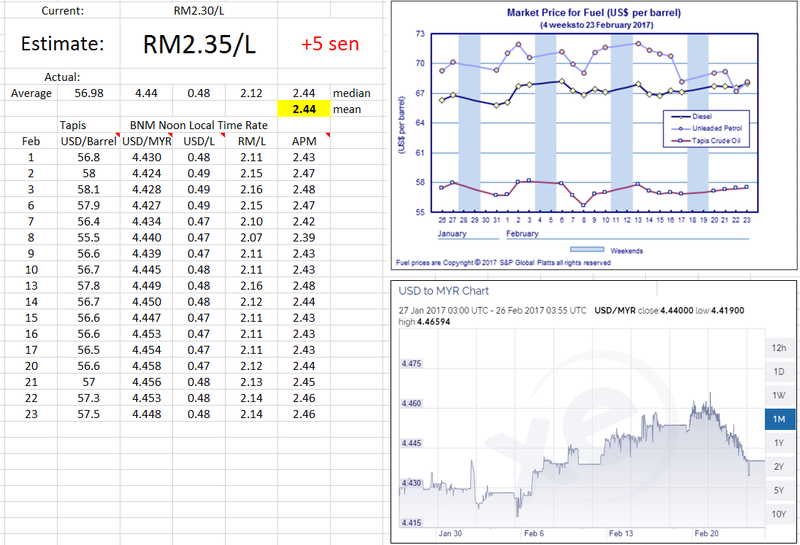 I am forecasting either current prices to stay or it may go up further by 5 sen (RM2.30->RM2.35) for RON 95. Bear in mind that the APM is around RM 2.44 so somewhere in the middleman (oil company or petrol dealer) field is taking a profit cut by selling lower than the APM price point. 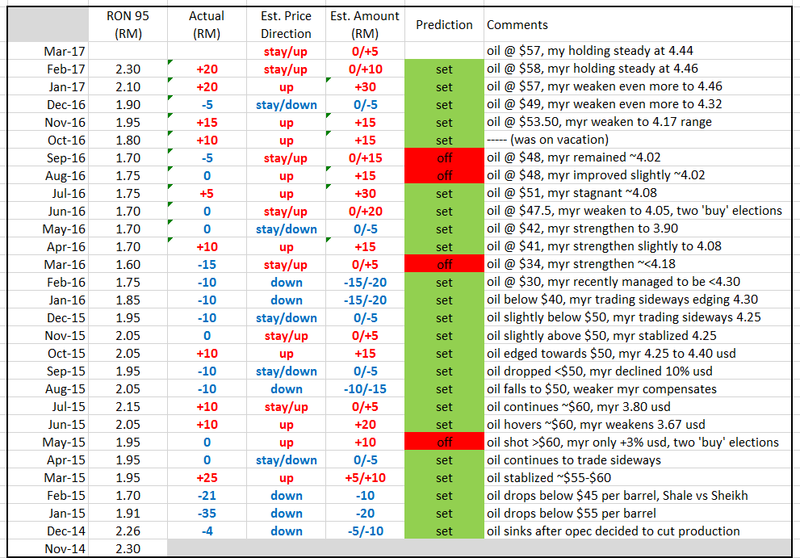 Below is a table of my previous forecasts since the beginning. 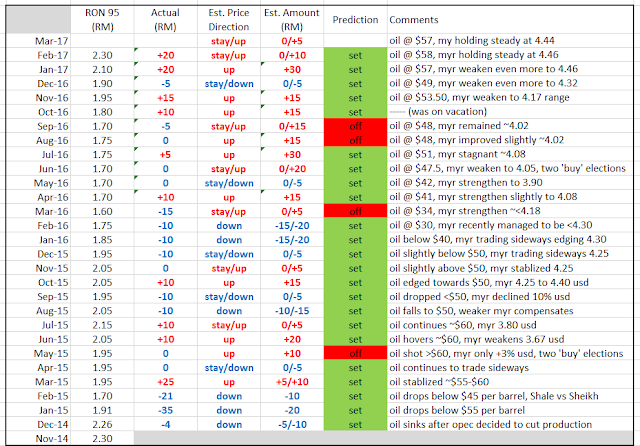 My forecasts are based on Tapis crude oil price, performance of Ringgit and domestic political matter.